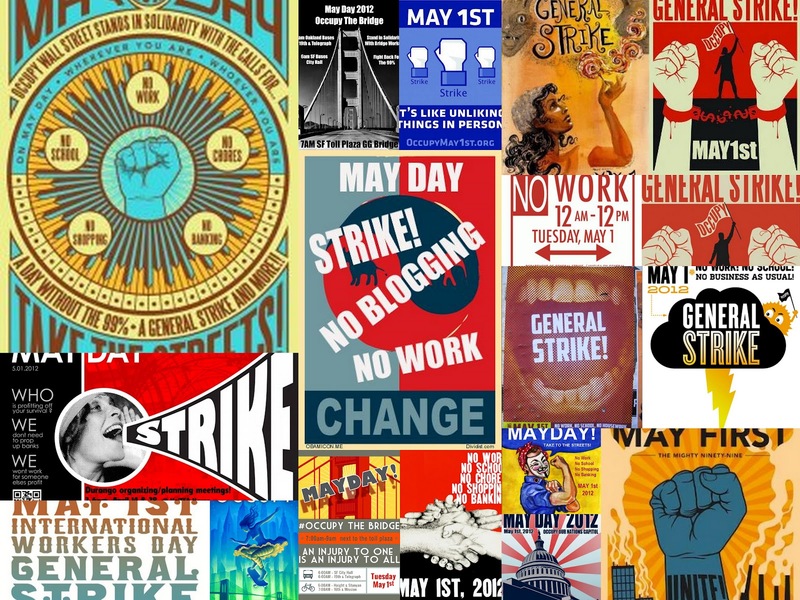 Welcome to the 53rd edition of the Carnival of Divided Government - Special "MAY DAY GENERAL STRIKE!!!!" Edition. 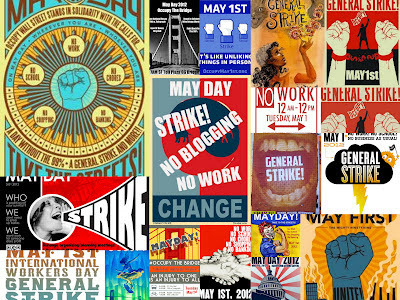 It is the First of May - International Worker's Day - May Day - and the official start of the Occupy [FILL IN THE BLANK]! protest season. 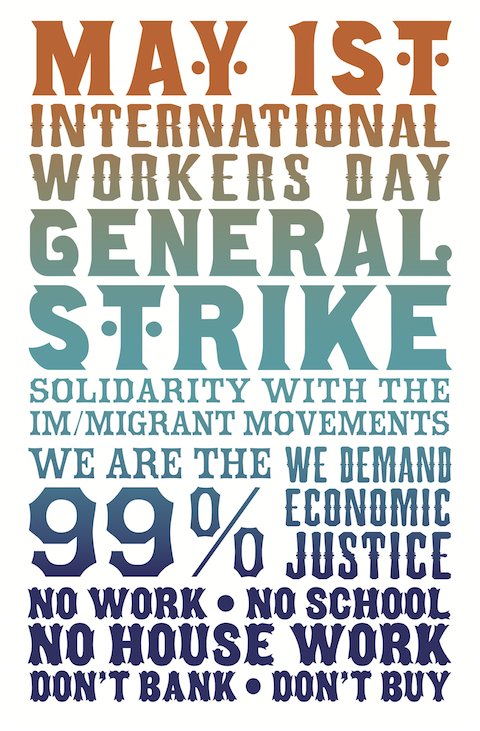 Today the Occupiers kick off the season by calling for a national General Strike. Their inspiring motto: "No Work. No School. No Banking. No Shopping. No Housework." is emblazoned across dramatic posters calling for May Day protest actions. Vera HC Chan has identified what may be their most important and lasting cultural contribution: "Whatever the outcome of May Day, one thing has clearly emerged -- the return of propaganda art." Wait. What? No House Work? Yeah. The poster actually says "No House Work." Is this really how the "99%" are going to stick it to the man? No house work? Some of the posters substitute "No Chores". No joke. It's like an Onion story. Here in EssEff, the Occupiers were very excited about closing the Golden Gate Bridge. Until they decided not to close the Golden Gate Bridge. Then, apparently experiencing some Midwest Protest Envy, they decided to embark on a "Wisconsin-Style Occupation of San Francisco City Hall". And just like in Wisconsin, about 300 protesters marched into City Hall carrying sleeping bags, made some noise, then left. I guess that is sort of like what happened in Wisconsin. Well, if all else fails, they always have breaking windows and vandalizing small businesses in minority neighborhoods to fall back on. The Dividist is disappointed that "No Blogging!" was not included in the general strike directives. He now has no excuse for failing to get this latest Carnival of Divided Government posted as scheduled. As explained in earlier editions, we have adopted Latin ordinal numeration to impart a patina of gravitas reflecting the historical importance of the series. In this the Carnival of Divided Government LIII (Três et Quînquâgintâ), as in all of the CODGOV editions, we select volunteers and draftees from the blogosphere and main stream media writing on the single topic of government divided between the major parties (leaving it to the reader to sort out volunteers from draftees). Actually it is perfectly deniable. In this recent incarnation of divided government, we have seen bills passed on a bipartisan basis and bills defeated on a bipartisan basis. To his credit, Harry does avoid the conventional and intellectually lazy path of blaming divided government for a lack of legislative productivity. He correctly cites Mayhew's finding that legislative productivity does not correlate with periods of united vs. divided government. However, he misses Mayhew's contention that change occurs when there is a pervasive public demand for that change. The jury is still out on this congress. There is still reason to believe that this Congress will address the unsustainable debt and spending in Washington DC. It probably won't happen until the lame duck session, but it will be addressed and it will be addressed in a bipartisan manner, and Harry Lambert will still be disappointed. "...some conservatives and libertarians I ordinarily respect are saying oh, ho hum, it is no big deal if President Barack Obama gets re-elected because — listen up, worriers — we have separation of powers. We have divided government. Both houses of Congress are likely to be Republican after November’s election, and they will keep this guy in check. Excuse me, but have these fine folks paid any attention whatsoever to the past century or so of American history, to the gradually, then dramatically growing power of the executive?" Jay has a point, but overlooks several others. Voters of an independent mind, in particular libertarians, are more concerned with the enhanced executive power of a republican president unconstrained by a lay-down republican congress, than a democratic president fighting a republican congress. Returning to One Party Rule will make the problem of executive branch overreach even worse than it is today. A potential silver lining when executive and legislative branches are divided on partisan lines: Any additional overreach by the President may act as a catalyst for Congress to finally reassert itself and reclaim it's constitutionally mandated power and authority usurped from the executive branch. "Mann and Ornstein observe, "Divided government has produced something closer to complete gridlock than we have ever seen." Yes, and please pass the potatoes. Republicans are acting the same way they ever did (late in the last century) in opposition to a Democratic president. It's just that they took a half-time break, easing up during the long years of the George W. Bush presidency and its wars. The Mann-Ornstein analysis (published in a new book available this week) is sound and welcome. At last an "official" acknowledgement that there is no center in national politics, so therefore it cannot hold." Jamie's complaint can be distilled to this: "Republicans are destroying democracy because they refuse to vote like Democrats." There is nothing quite so galling to liberal Democrats as Republicans voting like Republicans. But, there is a reason why there was a Republican electoral tsunami flipping control of the House in 2010. Voters simply did not want more of the insane fiscally irresponsible spending on display during two years of Democratic Single Party Democratic Rule. They saw two trillion dollars of new spending passed in two bills in two years on purely partisan Democratic votes (Obamacare and Porkulus). Enough was enough. Republicans in congress are doing exactly what they were voted to congress to do. As regards Mann & Ornstein, the Dividist will just note that they used to support divided government, but that was when it was Republican One Party Rule being divided. Last year, despite weeks of behind-the-scenes negotiations with his own conference, Conrad abandoned a budget markup after it became clear it lacked support from Democrats, who complained it was too conservative. Majority Leader Harry Reid (D-Nev.) sealed its fate, saying it was “foolish” to pass a budget as Vice President Joe Biden was negotiating a deal to raise the debt ceiling. With eight months left in his final term, Conrad is returning to Bowles-Simpson, a Quixote-like effort considering the House last month rejected that plan 38-382, and Reid shows no desire to touch the commission’s deficit blueprint." "Divided government can sometimes have good results, as it did during the Gingrich– Clinton years, but it can also have bad ones. When the government is divided, or when the majority party holds only a very small majority in one of the houses, there are very powerful incentives to accede to the least painful of the other side’s demands. Democrats have been energetic in condemning the “Bush tax cuts” and blaming them for the high deficits currently afflicting us, but they have made no serious effort to repeal the bulk of them, because the majority of the tax cuts went to households earning less than $200,000 a year. In fact, Democrats have touted the payroll-tax deal as a key domestic achievement, as though talking Republicans into supporting an irresponsible tax cut were one of the labors of Hercules." The Dividist is sympathetic to Kevin's argument. Examples of truly bad bipartisan legislation are legion. But as that noted Political Scientist Albert Einstein once said: "It's all relative." We are grading on a curve here. The risk of bad bipartisan legislation under divided government is not as bad as the parade of horribles to be seen when partisan legislation is passed under One Party Rule. 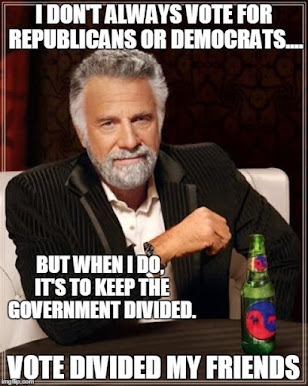 We don't always get good compromise under divided government. But we never get meaningful compromise at all under One Party Rule. "Even after more than a year of pointed disagreements between President Obama and House Republicans, a narrow plurality of voters said that Washington is “more likely to make progress” on the major issues facing the country if it has a divided government after the 2012 elections. Both parties are furiously trying to sell their vision to the nation, but wary voters, after three consecutive wave elections that saw at least 20 House seats change party hands, don’t appear ready to grant either side an unequivocal mandate." He says that like it's a bad thing. It's not. Shane's conclusion makes the Dividist feel all warm and fuzzy inside. To Norquist, however, the solution is simple: a Romney victory combined with a Republican Senate takeover (complete with supermajority) by 2014. Then, as far as he's concerned, the problem of gridlock will solve itself." This article puts the dilemma confronting independent/centrist/libertarianish voters into crystal clear perspective. There are worse things than division and gridlock. We are a divided country. As a consequence we have a divided government. We can have a united government, but only if it is United One Party Democratic Rule or United One Party Republican Rule. If you want a centrist policy result, you can get an approximation of moderate/centrist policy by always voting for divided government. Compromise is forced. It is painful, it is ugly, but compromise happens when it needs to happen. It does not matter if there is no "center", we can still get a centrist result. A barbell has no center. It can still be balanced. True. One way to keep our constitutional checks on power reinforced and not undermined is for a few percent of the electorate to consistently vote to prevent one party control of the executive and both legislative branches. To pit ambition against ambition. It is clear that something needs to change in order to combat the national debt. The country will never be able to return to the prosperous times if the attitude of the national government does not change and do what is best for the American people." Fear not Mary. Churchill may have said it best. "Americans can always be counted on to do the right thing...after they have exhausted all other possibilities." So it is with our government. "When Congress returns to work after the November elections, some members will have lost their re-election bids and will know that come January, when the 113th Congress begins, they will not be returning to Capitol Hill. Speaking March 27 in Washington, Rep. Barney Frank, D-Mass., predicted December would be the most powerful lame-duck session in history, with the results of the November elections shaping everything. While a decisive win for either party would remove any incentive to tackle these big problems in December, the consensus is that divided government is here to stay. The likelihood that either side will receive a mandate to act from the election is very low, said Mackenzie Eaglen, a fellow at the American Enterprise Institute. While the White House or one of the congressional chambers could flip, the government will likely remain divided between the two parties, she said. For that reason, the results of the election may not matter all that much, Berteau said. "I have cautious optimism that the lame duck might be able to solve this, almost regardless of the outcome of the election," he said. For now, Berteau is not alone in his optimism. "There is a genuine desire on the part of members of both parties for a deal that goes big," Eaglen said." Here is the thing. Divided government doesn't work until it does. 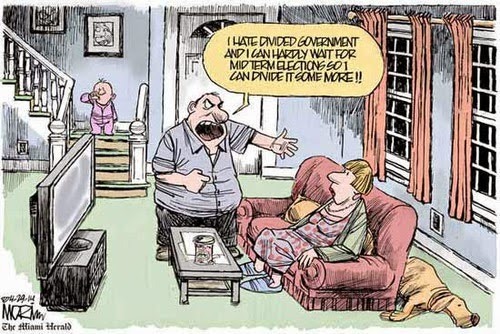 Divided government only works when it needs to. It needs to work before the end of the year. So it will. With that we conclude this edition. Look for the 54th Edition of the Carnival of Divided Government Quattuor et Quînquâgintâ (LIV) - Special Day of Mourning for The Loss of the Colonies Edition - sometime on or about July 5. Please submit your blog article at the carnival of divided government using our carnival submission form.